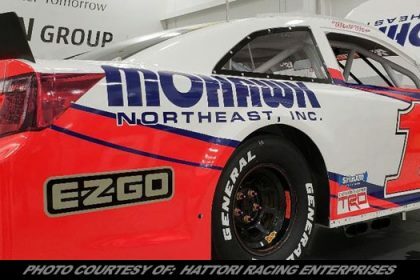 Story By: SCOTT RUNNING / STAFFORD MOTOR SPEEDWAY – STAFFORD SPRINGS, CT – Stafford Speedway returned to NASCAR Whelen All-American Series racing action on Friday, June 15th as part of Whelen Event Night. It was a night of milestones for the two premier divisions as Michael Christopher, Jr. scored his first career SK Modified® win by outdueling Ryan Preece in his Uncle Ted’s car. 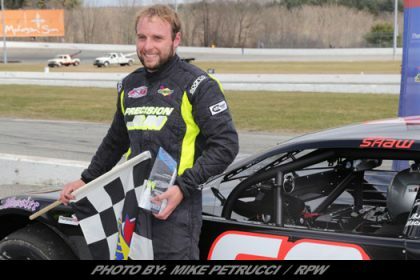 The second milestone was Tom Fearn setting a Stafford Speedway track record for consecutive Late Model wins by winning his fifth consecutive race of the 2018 season. Other feature wins were scored by Andrew Molleur in the SK Light feature, Duane Provost in the Limited Late Model feature, and Trace Beyer in the Street Stock division. In the 40-lap SK Modified® feature event, Tyler Hines set the early pace. On lap-5, several cars got loose in turn 4 but everyone was able to continue forwards and the race stayed green. Michael Christopher, Jr. was up to second behind Hines with Matt Galko, Stephen Kopcik, and Keith Rocco making up the top-5. Christopher took the lead from Hines on lap-12 and the caution flew with 14 laps complete as Joey Cipriano spun coming out of turn 4 to slow the action. Christopher took the lead on the restart with Galko in second. Rocco and Hines were side by side for third with Ryan Preece right behind them. 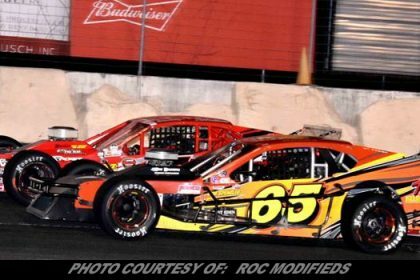 Rocco took third on lap-16 and Preece followed him through to move into fourth. Tom Bolles scraped the backstretch wall and kept on going while Hines got out of shape and nearly spun but kept his car moving forward as he slid back to 19th place. At the halfway point, it was still Christopher out front with Preece up to second. Ronnie Williams was up to third with Galko fourth and Rocco fifth. Preece was starting to hound Christopher for the lead when the caution came back out with 27 laps complete for Hines, who spun coming out of turn 4. Christopher took the lead back under g reen with Preece glued to his back bumper. Preece made a move to the inside of Christopher on lap-29 and he took the lead. Williams was third but he had Todd Owen looking to his outside for the position. Owen used the high line to his advantage and he took third from Williams on lap-31. 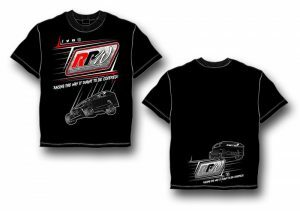 Rocco followed Owen in the high line and he moved up to fourth as Williams slid back to seventh place. Christopher got a good run and went back by Preece for the lead on lap-35 in the high lane. 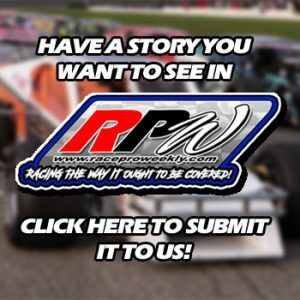 Preece came back to the inside of Christopher and the two cars touched wheels in turn 1 on lap-37 but neither driver took their foot off the gas. Preece got loose in turn 4 on lap-38 as he tried to turn in underneath Christopher but he gathered his car back up and was right back on Christopher’s bumper when the caution came out with 38 laps complete for a solo spin in turn 2 by Zack Leone. 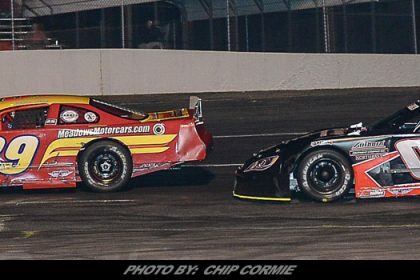 Christopher and Preece went wheel to wheel on the restart with Preece falling into line behind Christopher coming to the white flag. Preeece made one las run coming to the checkered flag but Christopher held him off to score his first career SK Modified® victory. Rocco finished third with Owen and Galko rounding out the top-5. In the 30-lap Late Model feature event, Chase Cook took the early lead with Tyler Leary, Darrell Keane, Al Saunders, and Michael Wray lined up behind him. Tom Fearn was sixth with Mike Quintiliano seventh and Paul Arute eighth. Fearn took fifth from Wray on lap-4 while at the front, Leary was in the lead with Cook sliding back to fourth as Keane took second and Al Saunders third. Fearn quickly worked his way up to second behind Leary when the caution flew with 14 laps complete for Cook, who spun in the middle of turns 1+2. Leary took the lead on the restart but Fearn would take the lead on lap-16. Wray was third with Al Saunders fourth and Keane was fifth. Fearn led Leary to the checkered flag to record his fifth consecutive Late Model feature win. Wray finished third with Al Saunders and Keane rounding out the top-5. Fearn’s fifth consecutive win set a Stafford Speedway track record for consecutive Late Model wins. In the 20-lap SK Light feature event, Joey Ferrigno took the lead at the green with Todd Douillard taking a look to his outside. Brett Gonyaw was able to get to the inside of Douillard on lap-2 and he moved into second with Douillard taking third. Geoff Nooney and Bob Charland were side by side for fourth place with Andrew Molleur right behind them in sixth. Gonyaw drifted up the track in turn 4 on lap-5 but he was able to maintain the lead with Ferrigno right behind him. Douillard was third with Molleur getting around both Nooney and Charland to move into fourth. Molleur then pulled alongside Douillard on lap-9 in a fight for third with Nooney in fifth. Molleur cleared Douillard on lap-10 with Gonyaw still in front and Ferrigno in second. Molleur took to the outside lane to take second from Ferrigno on lap-11 and by lap-13 he was applying heavy pressure to Gonyaw for the lead. Behind the lead trio, Bryan Narducci has moved up to fourth with Mark Bakaj in fifth. Molleur was able to get alongside Gonyaw but Gonyaw was strong enough to hold him off. Narducci went around Ferrigno on lap-17 to move into third and the caution came out with 17 laps complete for Douillard, who came to a stop on the turn 3 infield grass. Gonyaw and Molleur ran side by side for a lap before Molleur took the lead as the cars completed lap-18. Molleur cleared Gonyaw on the white flag lap and he led Gonyaw to the checkered flag to pick up his second win of the 2018 season. Narducci finished third with Bakaj and Mikey Flynn rounding out the top-5. In the 20-lap Limited Late Model feature event, Matt Clement took the early race lead with R.J. Surdell in second. 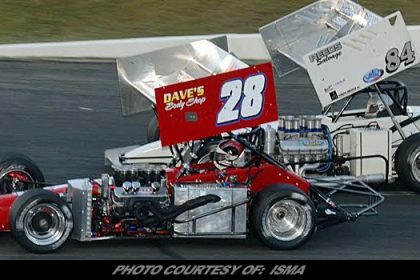 Duane Provost was third with Jeremy Lavoie quickly moving up to fourth and Andy Marchese taking fifth from Gary Patnode. Ryan Fearn was on the charge early, quickly working his way thorugh the field and he took fifth from Marchese on lap-4 as Clement continued to lead the race. Fearn continued to work his way forwards as he took fourth from Provost on lap-8 with Clement still leading Surdell and Lavoie. Lavoie was looking high and low for a way to get around Surdell for second but Surdell was able to hold him off. Lavoie finally was able to make a pass stick on lap-13 as he took second in turn 2. Fearn followed in Lavoie’s tire tracks and pulled alongside Surdell and they ran side by side for a lap before the two cars made slight contact with Surdell going around in the middle of turns 3+4 to bring the caution out with 14 laps complete. Fearn was black flagged and sent to the rear of the field for the contact with Surdell. Clement took the lead on the restart with Provost moving into second. Lavoie was third with Steven Midford up to fourth and Fearn back up to fifth after his penalty. With 2 laps to go, Provost was right on Clement’s back bumper with Lavoie looking to pass them both in the high groove. The top-3 settled back into line as they took the white flag. Clement was able to hold off Provost to the checkered flag. 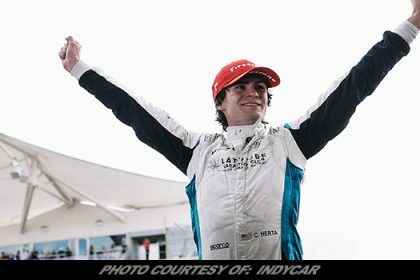 Following post race inspection, Clement’s car was found to be 5 pounds underweight and he was penalized 5 positions, one for every pound underweight, and he finished 6th, making Provost the feature winner. The new top-5 was Provost followed by Lavoie, Midford, Fearn, and Surdell. In the 20-lap Street Stock feature event, Chuck Harrison took the early lead at the green flag with Richard Ciriello, Trace Beyer, Chris Bagnall, Jason Lafayette, Travis Hydar, Brandon Michael, and Nicole Chambrello lined up behind him. 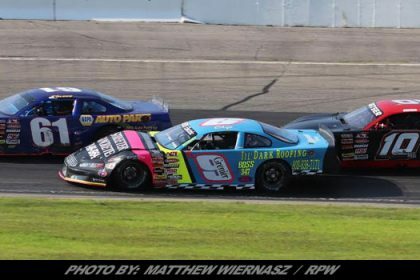 Hydar was on the charge as he quickly moved into third in the first 4 laps with Michael following him through the field while up front Beyer took the lead from Harrison before the caution came out with 4 laps complete for a spin in turn 4 by Chris Danielczuk. Beyer took the lead back under green with Hydar taking second from Harrison. The caution came back out with 6 laps complete as Greg DeMone and Samantha Anderson got together and spun on the frontstretch with Anderson’s car collecting the car of William DesJardins with Vince Gambacorta also involved. Beyer took the lead on the restart with Michael getting around Hydar to move up to second. Harrison was fourth in line behind Hydar with Lafayette making up the top-5. George Bessette, Jr. was up to sixth with Mike Hopkins in seventh and Chambrello in eighth. Beyer was starting to stretch out his lead at the front while the battle for fifth was heating up as the trio of Hopkins, Bessette, and Chambrello were right on back bumper of Lafayette. Chambrello got by Bessette and Hopkins to move into fifth on lap-18 and she took fourth from Harrison on lap-19. 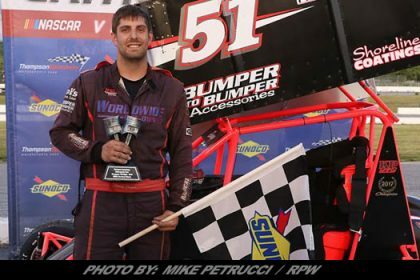 Beyer led Michael to the checkered flag to pick up his first win of the 2018 season. Hydar finished third with Chambrello and Bessette rounding out the top-5.